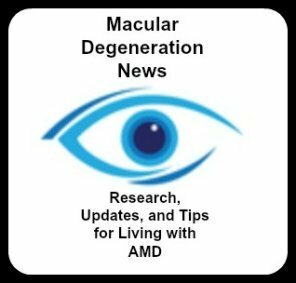 Macular Degeneration Symptoms - Or Not! My mum has macular degeneration (she hasn't been told if its wet or dry yet)and over the weekend she has developed a bloodshot eye - in the inside corner of her eye. It stretches between the tear duct and the coloured part of her eye. Is this an effect and if it is what does it mean? Thanks for your question.This does not sound as if it is related to macular degeneration. Macular degeneration affects the retina which is the inside lining of the eye. The outside of the eye can turn red for many unrelated reasons, but certainly not a manifestation of macular degeneration. Macular Degeneration Symptoms - Watery eyes? I have wet in one eye and dry in one eye MD and was wondering if this would cause my eyes to be watery? Both my eyes have been really watery. Watering eyes is not one of the typical macular degeneration symptoms. The most common symptoms are loss of contrast sensitivity, loss of one's central vision, blurred vision, and straight lines appear wavy. If you spend lots of time using your eyes for close up vision - whether it's on a computer or a low vision CCTV you may be experiencing a symptom of computer eye strain. However, it is always a good idea to be communicating any eye symptoms you are having with your eye doctor. Does Macular Degeneration cause a person to see things such as people that are not there? It is the name of a condition that results in people seeing things that they know really are not there. A person may "see" people, objects, or animals. Or they may see patterns of things. It is most commonly experienced by older people who have had severe loss of vision, including those with macular degeneration. Visual Hallucinations - A Symptom of Macular Degeneration? M mother has macular degeneration. She has recently got three shots in her eye two weeks ago to prevent this disease from advancement. She is 79 years of age. Since that time she is seeing tigers and monsters. Is this normal? Charles Bonnet Syndrome is the name of a condition that results in people seeing things that they know really are not there. I'm extremely distressed by what seems to be macular degeneration symptoms in my right eye, after having perfect vision until the age of 47. First you need to get to an eye doctor as soon as possible for an eye exam and diagnosis. You can't get into a clinical trial without that first. If you can't afford and eye exam you can check with your local Lion's Club. You may find a number in your local directory. Here is their main telephone number 630-571-5466. EyeCare America is a public service program of the Foundation of the American Academy of Ophthalmology. Eye care is provided through volunteer ophthalmologists at no cost to those who qualify. Let us know what the eye doctor tell you. My mother has Charles Bonnet syndrome and it is both making her extremely depressed and scared. She really thinks she is crazy. How can I help her? Is there support groups, therapists, or any known treatment that can help her to continue fighting this disease. Thanks for your question. First I am glad to hear that you are aware of Charles Bonnet Syndrome, as many people are not - which makes these visual hallucinations even more troubling. There are a few suggestions on this page of the website. Continue to reassure her that this is the result of the brain not getting enough visual stimulation. If any other readers have any suggestions please post them.